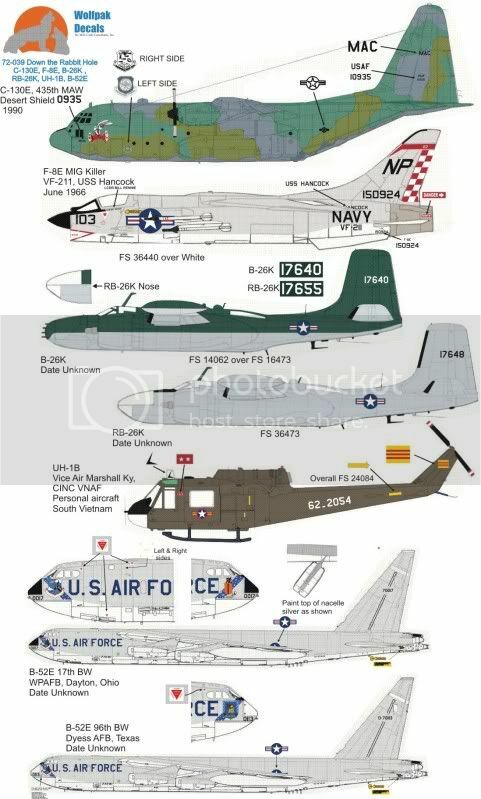 Sheet 72-039: A Desert Storm C-130E with Rabbit Noseart, A choice of B-26K’s and RB-26K’s in the emerald green and grey scheme or a RB-26K in just coin grey. A F-8 Mig Killer. Vice Marshall Ky’s UH-1B and a choice of a silver over white B-52E from either the 17th or 96th Bomb Wings. 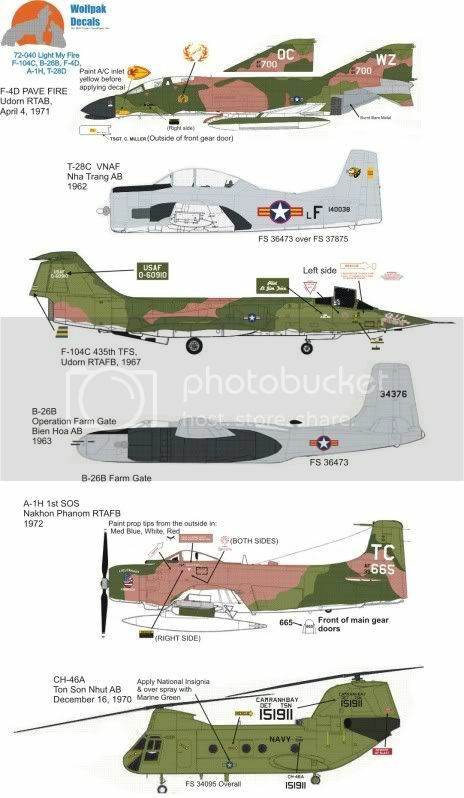 Sheet 72-040: The following aircraft from the Vietnam war: A PAVE FIRE F-4D, South Vietnamese Air Force T-28C, F-104C “PussyCat”, A-1H “Lt. America,” Operation Farm Gate B-26B and a Navy CH-46A. 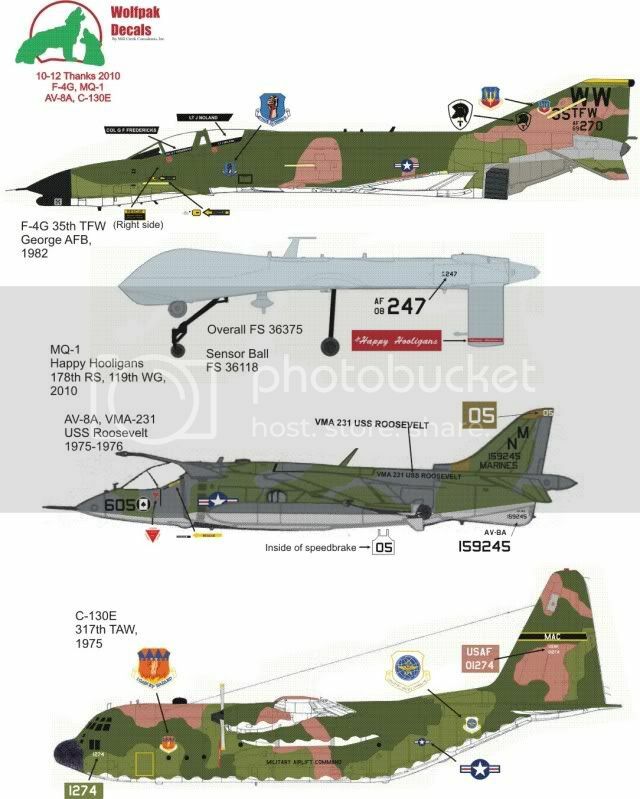 Sheet 10-12: A F-4G in SEA camo from the 35th TFW, a Happy Hooligans MQ-1 Predator, an AV-8A from the cruise of VMA-231 onboard the FDR in 1975-1976 and a 317th MAW C-130E from Pope AFB. Once again I’d like to say thanks to all those who patronize Wolfpak.